Soap bubble hurricane: Physics Girl tackles thin film science. 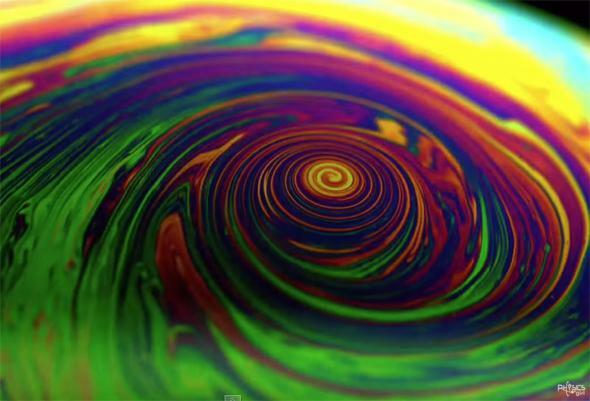 The whorls and convection in a soap bubble. I used to play a lot with soap bubbles. Long after I grew up, I mean. Scientifically, they’re very interesting; they explore such topics as thin film surfaces, optical interference, least-area surfaces, shape packing, and all kinds of chemistry. Also, they’re pretty and silly and fun. But one thing that never occurred to me in all that time is that soap bubbles make a pretty good stand-in for hurricanes. It might surprise you that such a delicate and fragile structure might analogize one of the most powerful and destructive events on the Earth’s surface, but sometimes in science scale isn’t a problem. It doesn’t matter if it’s small or big, the interacting forces are what matter. Dianna’s a great science communicator; she has a knack for making complex issues simple, but not too simple. You should check out her other videos, especially this one on mirrors flipping right and left (… or do they? ), and this one on vortices in swimming pools. Bubbles are a lot of fun, and the science they show us is astonishing and beautiful. Especially, in my not-so-unbiased opinion, when they’re on the ten trillion kilometer or so scale. As an aside, congratulations to Dianna for now being a part of the PBS Digital Studios family! They’re partners with Hank and John Green in producing Crash Course Astronomy, so I’m a big fan of them.